To meet the statute language “a lane marked for bicycle use,” the lane must have this stencil in it. A bicycle lane is a part of the roadway intended to provide bicyclists with a more “comfortable” experience. Feeling safe does not equate to being safe. Research into the relative safety of bike lanes and shared lanes is inconclusive. The Federal Highway Administration does not have a crash reduction factor for bicycle lanes. Bicycle lanes are intended as “preferential use” lanes, not mandatory use lanes (although Florida statute 316.2065(5) now makes their use mandatory, with exceptions for unsafe conditions and situations). 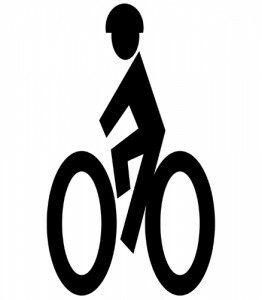 In order to meet the statutory language, the paved area in question must be marked with a bicycle symbol and a directional arrow. There are numerous spaces on area roads that do not meet minimum width standards and other characteristics of correct bike lane design. Bicyclists are permitted to use such spaces, but are not required to. The width of the adjacent lane then determines whether or not the bicyclist is required to share that lane. The minimum standard width for a bicycle lane is five feet from the lane stripe to the curb face, and a minimum of four feet of asphalt beyond the gutter pan. For state roadways with design speeds 50 mph and higher, the minimum width is 6.5 feet. Question Howard asked: Can you place a card stating it is” illegal to park in bike lane” on windshield of car that is parked in the bike lane? Question Herman asked: Why does the line that separates a bike lane from the travel lane turn to dashed at an intersection? Question Lisa asked: Can you ride a 49cc scooter in the bike lane in Florida? Question Sandy asked: I live in Weston, FL, where there are specific bike lanes. However there are “clubs” that ride together, 2-3-4-5 abreast at times that literally take over the entire right lane for drivers of autos. Is this legal?